On Monday, April 2, construction will begin at the intersection of Queen Street and Water Street for the first phase of a five-year project to rehabilitate underground infrastructure. During phase one construction will continue in the section of Water Street between Waldegrave Street and Bishop’s Cove. Hours of construction are Monday to Saturday, 7 a.m. to 7 p.m. with phase one expected to be completed by July 1. Queen Street will be closed to through traffic from George Street to Water Street for at least three to four weeks. 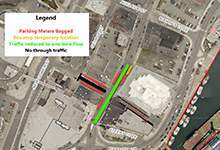 Traffic on Water Street will be reduced to one lane at times, with two-way traffic maintained by flagpersons. Thirteen parking stalls will be bagged in the area to accommodate heavy equipment and to maintain traffic flow. Sign up for traffic advisories at stjohns.ca. Sidewalks will remain open and two-way traffic maintained throughout the project. Although traffic delays may occur, Water Street will remain open and accessible to vehicle and pedestrian traffic for the duration of the project. For further information about the scope of this five-year project please visit engagestjohns.ca. As with any underground construction project there are many variables that can impact the timeline. The contractor is committed to working as quickly as possible to complete phase one by July 1.